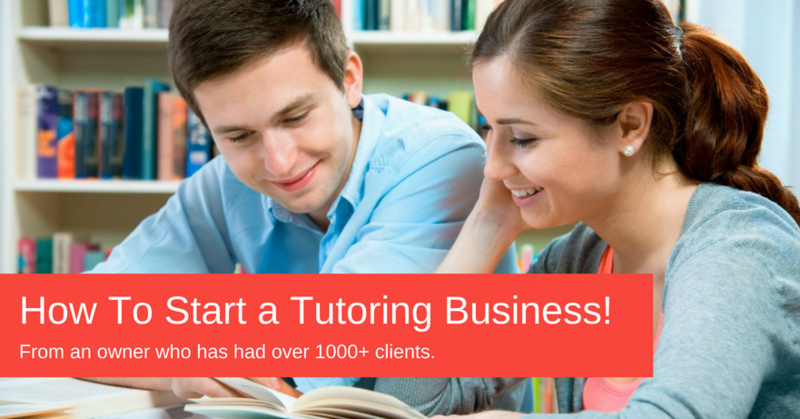 How To Start a Tutoring Business – From An Owner Who Has Had Over 1000+ Clients! When I was in 3rd-grade, I sold lemonade on the side of the street. When I entered 4th-grade, I started a home-care business helping neighbors within a 1.5-mile radius from my house. As I entered 7th-grade, I invested the $800 these businesses made into a tennis stringing machine and started stringing individual’s tennis rackets when the strings broke. I was making an extra $120 per week. When I was in 8th-grade, I wanted to invest the $8,000+ I had accumulated. My dad asked his financial advisor, and he referred me a book called “The Motley Fool”. I spent my summers reading investment books and learning about the stock market. When I was in 9th-grade, I invested in the stock market. Made some, lost some, and over the course of the year, realized I hated it. When I entered 10th-grade, I got my drivers license and started tutoring. My tutoring business started. I put signs on the side of the road, talked to people on the phone, and sold my services for $25 per hour. Within six months, I had eight clients and was working 2-hours per day, after track & field practice, and a couple of hours on the weekend. I was making around $1,000 per month. Clients kept calling me, but I had no more time, so, I started to hire my friends to tutor for me. I paid them $15 per hour and charged clients $25 per hour. Together, we made the difference. By the time I graduated high school, I had 15 tutors and over 40+ clients for my tutoring business. This tutoring business even ended up scoring me $85,000 in scholarships. It was my “differentiator”. You may have learned about this in my college planning webinar! Fast forward ten years, and we have helped over 1000+ tutoring clients and created a blog that attracts over 80,000+ visitors per month! I share this not to brag, but to show you that if a 16-year-old could start a tutoring business and make an extra $1,000 per month… so can you! Oh… did I mention I have a minor form of dyslexia? Hence… why this post may have a ton of grammar errors. I refused to have my editor edit it to prove a point. There’s no excuse why you can’t complete the following 5-steps and gain the freedom, income, and impact you deserve! You can tutor SOMETHING or utilize free tools, like Kahn Academy, to brush up on your facts. PS: We have shifted our company focus to helping teachers, tutors, educators, and anyone who is interested build profitable 6-figure online tutoring businesses. Believe it or not… it isn’t that hard… just takes a little work. Click here to book a free consultation with me if you are interested! 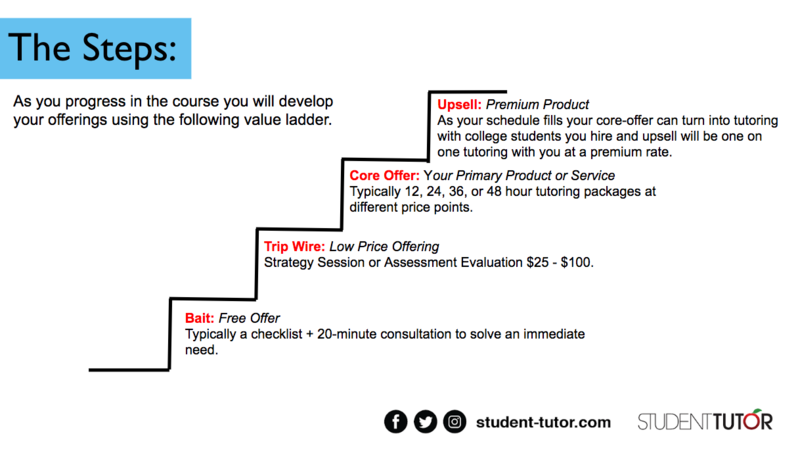 For your reference: This 5-step guide can be used to start any type of tutoring business. Below I have listed a couple examples, but it is not limited to these subjects. Math (Basic Math, Pre-Algebra, Algebra, Pre-Calculus, Calculus) Tutoring Business. Science (Chemistry, Biology, Physics) Tutoring Business. Reading (Phonics, Word Recognition, Comprehension) Tutoring Business. Writing (Creative Writing, Essays, Grammar) Tutoring Business. Language (Spanish, French, Mandarin Chinese, ASL) Tutoring Business. High School Test Prep (SSAT, SAT or ACT) Tutoring Business. College Level Academic Tutoring / Admissions Preparation Tutoring Business. Graduate School Entrance Test (LSAT, MCAT, GMAT) Tutoring Business. Professional Certification (CPA, CFA, Insurance Licensing) Tutoring Business. Before you get started on building your tutoring business, you need to make sure you use the power of your existing network. One of the best ways to do this is to let them know you are up to something unique! Post on social media sharing to the world you are up to something unique and send out an email to everyone on your list! Don’t think you have an email list? Think again! Use the app Skrapp on LinkedIn to find past teachers, parents, or anyone else that you think would be interested in the SAT/ACT, math, reading, writing LSAT, GMAT, Spanish, etc. tutoring business you are about to launch! Hey **! Thank you for opening my email! As you may already know, I’ve been a [teacher/tutor] for [time since tutoring]… but now… I’m working on something new for the students of our community! I’ll be sending out a few updates over the next two weeks… make sure you keep an eye out for my messages! This way, you won’t miss any of my updates! Now that everyone knows you are up to something, it is time to do some prep work before you launch your tutoring company. We’ll start by figuring out exactly what niche and problem you are solving. This is called your tutoring positioning statement. Do you plan on tutoring math for high school, math for elementary school, college, Spanish, writing, LSAT, MCAT, chemistry, physics, phonics for elementary, or SAT/ACT prep for college entrance? PRO TIP: Pick one! Niche down until it hurts. High school math tutoring is better than reading, writing, and math tutoring for K-12th grade. Next, what is the real problem you are solving? Why do parents want to tutor for their kids? Or why does a college student want a tutor for themselves? To eliminate stress and build confidence. Why do parents want SAT/ACT prep tutoring for their kids? To help students ensure college & scholarship success. Why does a post-graduate want an MCAT/LSAT/GMAT tutor? To better their lifestyle and find fulfillment in their work. By using the graph below, courtesy of Digital Marketer, you can identify what the status and average day changes are before and after they work with you. The more significant the gap, the more you can charge. Remember when you are tutoring you are focusing on changing their status and average day, not their grades and tests scores. Figure out what that is. Positioning Statement: I help [Niche Here] [Status Change] [Average Day Change] [Features & Benefits Change / Haves / Feels]! MATH, READING, WRITING, SCIENCE POSITIONING STATEMENT: I help [YOUR NICHE] eliminate academic stress and build confidence, resulting in skyrocketed grades and test scores. SAT/ACT/PSAT POSITIONING STATEMENT: I help students ensure college & scholarship success through skyrocketed SAT & ACT test scores. LSAT/MCAT/GMAT POSITIONING STATEMENT: I help college graduates better their lifestyle and create work fulfillment through skyrocketed MCAT, LSAT, and GMAT scores. For some odd reason, people forget when they do business online that we are still interacting with people! We need to build relationships before we ask them to marry us / buy something! In the marketing world, we call this your free offer or bait. Something that helps solve an immediate problem for the end-user. This would help solve an immediate problem for parents who are stressed and not sure if they are on the right timeline. This would help solve an immediate problem for college graduates who are looking for a solution to get started. PS: We give you proven free offers in our masterclass. Click here to book a free consultation! This is typically a strategy session or assessment test given at a low price, and offers you the chance to evaluate where the client stands. Through this assessment, you can let the client know what you, the expert, believes they need. After the strategy session, you can sell your core offer based on what you learned. Typically, this is a tutoring package at mutually beneficial discounted prices. For SAT or ACT, you might want to start out at $75+ per hour. MCAT, LSAT, GMAT $150+ per hour. Academic tutoring $55+ per hour. However, these prices change based on geographic location and experience. I recommend you Google the local and national tutoring companies to get an idea of what price the tutoring marketplace for your niche is willing to pay. The step we have all been waiting for! Sounds hard right? Well… maybe if it was 2005! By combining Click Funnels and our proven website template… we can get your website up in less than 1-hour if we focus! Most sites will only take 2-3 hours. Now… PLEASE, don’t worry about the details or changing the design too much. Our model works. It does what it needs to do and is made to get you clients FAST! We have tested it… so use it! Plus, we have pre-made templates that are local SEO friendly for a variety of tutoring businesses that you may be thinking of starting. LSAT, MCAT, GMAT, SAT, ACT, PSAT math, science, foreign languages, etc., tutoring businesses website templates are available and ready! More coming soon! Click here to get your FREE tutoring website template!! Please Note: Click Funnels cost $97 per month, BUT comes with a FREE 14-day trial. We understand that $97 may be expensive for some of you. However, building an entire business website from scratch will be even more expensive and time-consuming. Our recommendation… finish it QUICKLY and LAUNCH YOUR TUTORING BUSINESS; then, be the judge if it was a good idea or not. You can cancel Click Funnels at any time. Think about it… For $97 per month, you will have all the software you need to run a full-blown online tutoring business! Pretty inexpensive, if you ask me, considering one tutoring client will make you $1,300+ on average. Additional Note: By clicking on the link we get an affiliate commission if you become a paid customer. Although this helps us financially, we would still be making the same recommendation. We also use this software daily! Curious to see our track record and how we have outranked competitors like Varsity Tutors, Wyzant, Kaplan, and more via Google?! See the image below or Google generic terms like “top math websites”, “how to improve GPA”, “AP or honors classes” or dozens of other generic terms and see us ranking #1. Use the tutoring website template above + follow the videos to start down this path! You are now ready to officially launch your business! For your launch party, you are going to have to do something a little scary… well, scary for MOST. A FACEBOOK LIVE VIDEO, WHERE YOU GET VULNERABLE! The goal of the Facebook live is to connect with your audience on an authentic level. You want to take them on a ride and become your #1 raving fans! You tell a story that connects to your offer. Breaking news everyone! I have officially launched a tutoring company to help students eliminate stress and develop confidence. Listen to my story via this Facebook Live where I share some things I haven’t shared publicly before. Click here to learn more about my company and get my free launching gift! Thanks, everyone! First 3-5 seconds get everyone’s attention by doing something different! Let everyone know you will be starting soon and will be sharing something extraordinary that you haven’t shared before, so stick around as people join in. Get vulnerable and share why you got into teaching/tutoring, the struggles you have had, and the triumphs you have had with students. Transition the story to step #5. Connect your story to your offer! Finally, email everyone including your Facebook live video link letting them know your surprise has been released! Now your entire audience will know your MCAT, LSAT, SAT, ACT, math, reading, writing, chemistry, biology, physics tutoring business has been started! The surprise I’ve been anxiously preparing for you is finally ready for delivery!! I’ll be sending out the first few copies today… make sure you get yours! Click here to access my [name of document] now! This will only be available for a short while… so go download it today! Your tutoring website is local SEO friendly for the niche you were targeting, but you need to let Google know it is legit! You get local links pointing toward your website! The easiest and fastest local links to get are going to be local directories like Yelp, Yellow pages, Bing Places, Google Places, etc. To get them done quickly, we recommend you check out Moz Local. They will help you get on the majority of local listing across your area. Afterward, reach out to some local blogs in the education space and see if you can write a guest post. The goal is not to get leads from those blogs, but to get links pointing toward your website to help improve your local SEO. Starting a 6-figure tutoring business is not a walk in the park… it does take some work… but if you keep at it you can get there! The tutoring industry is a 7-billion dollar market… there are plenty of clients to go around, so don’t worry if your next door neighbor “Angie” is offering SAT prep already. By following the following 5-step process, you will start seeing results in no time! Are you interested in having us hold your hand throughout this entire process to ensure your business is a success + gain access to dozens of tutoring tools, courses, sales scripts, etc. AND even the ability to write on our blog for national SEO optimization + reach!? Then book a free consultation by clicking the link below! Click here to book a free tutoring business consultation with me! PS: Notice how I didn’t talk about figuring out your business name, creating a logo, developing a budget, etc. Why? Because I already made that mistake and don’t want you to! In fact, I have 60-page detailed business page documents that I NEVER USE! WHAT A WASTE! Too many people PLAN, PLAN, PLAN… instead of DO! PLEASE, don’t make the same mistake that I made and follow the simple 5-steps. We live in the digital age. It really is that easy! Watch this video where I share my old business plans before I headed out on my 8-month journey across the country to give college planning presentations.